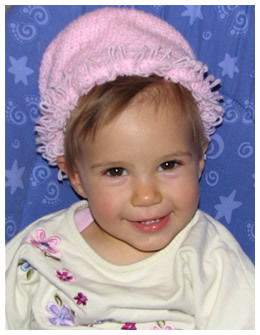 Amelia was born September 29, 2006 and was a sweet, easy-going baby right from the start. Her baby book filled up as it should have - first smile at four weeks, rolled over at four months, babbled at five months. But from six to nine months, she got stuck in a holding pattern. She was still reaching milestones, but at a much slower rate. At nine months she would roll across the room to get to a toy, and she could almost get into the crawling position, so we figured she would eventually get it. Little did we know that Amelia had reached her developmental peak and would regress from then on. I made an appointment with Amelia's pediatrician because she still couldn't sit up without using her arms for support. We'd been going to the same pediatrician since Amelia's big sister was born, and for four years every time I'd taken one of the girls to the doctor I got the same response: "Don't worry about it, she'll be fine." When I told our pediatrician that Amelia couldn't hold her head up when she got tired, there was a look on his face that I had never seen before. I knew at that moment that something was wrong with our daughter. A week later, a pediatric neurologist told us that something was seriously wrong with Amelia's brain, but she wouldn't know what until the MRI, EEG, blood and ophthalmology tests were back. We were expecting cerebral palsy or mental retardation. The possibility that Amelia was dying didn't even cross our minds. I had heard of Tay-Sachs because during each of my pregnancies, I had to complete a prenatal genetic testing check sheet. You go down the list and if you're Black you check the sickle cell anemia box. If you're Jewish, you check the Tay-Sachs box, and so on. Well, I'm not Jewish. Nor am I French-Canadian, Irish, or Cajun, so I was never tested. I often wonder how my life would have been different if I'd checked that box during any of my pregnancies. One little "x" could have changed everything. Tay-Sachs is a relentless disease. Watching Amelia become weaker, lethargic, quieter, unable to use her arms and hands, slower, floppier, skinnier, unable to eat, uncoordinated, and less alert is heartbreaking. She's lost many of her physical and mental abilities. The regression is not gradual. It happens every day, right before our eyes. At fifteen months, Amelia can still see and hear, smile and laugh, move her arms and legs (but not use them), and drink from a bottle. She isn't able to consume the amount of calories she needs, so she's having a permanent feeding tube put in. Amelia has never had a seizure or pneumonia, although we know these horrible things are inevitable. Summing up this experience with lessons learned and the purpose we've found in our new life almost seems unfair. This isn't about me or my husband or our families or anyone's faith in God. This disease is happening to Amelia. She is the one who is ultimately going to suffer and die from it. I don't know if I was chosen to be the parent of this special child or if this disease is as random as Amelia getting her dad's brown eyes instead of my blue. Everyone wants there to be a reason for this, for Amelia not to suffer in vain. Amelia's life has enriched all of our lives and taught us things very different than a healthy child's life does. She's brought awareness about Tay-Sachs to our community and now future generations of our families don't have to relive this same tragedy. But I can't see any good reason for a child to go through this, no matter how much good comes from it. It's the job of a parent to suffer and sacrifice for their children and community, not the other way around. So maybe, just like a healthy baby, her sweet smile and soft, gentle touch is enough for her life to have purpose.